The Plug and Play Screamer—Ear Splitting Motorcycle Safety! Russ Brown Motorcycle Attorneys;A screaming banshee motorcycle horn to alert motorists of your presence. 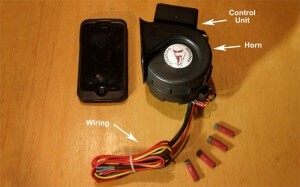 This year’s best motorcycle safety invention may very well be the plug and play screamer motorcycle horn. Motorcyclists are notoriously put in harm’s way every day on crowded city roads and highways. The main reason: motorists often do not notice motorcyclists who share these roads, and as a result, they can cause horrific motorcycle accidents. This is the very reason that engineer and motorcyclist Peter Olt decided to create the plug and play screamer motorcycle horn. The plug and play screamer is an ear splitting, screaming banshee motorcycle horn that will certainly get the attention of someone who is about to cut you off in traffic or move into your lane. When you need it most, you simply press the horn button down. At first your regular horn will sound, but then an ear splitting 120 decibel repetitive shriek will sound while your high-beam headlight pulses for extra safety. This Plug and Play Screamer is designed to alert other motorists of your presence and ensure that you arrive safely at your destination—no matter where you ride. Best yet, the Plug and Play Screamer is easy to install and is only about the size of an iPhone. As of now though, the Plug and Play Screamer is still just a concept that is looking for the right manufacturer and financial support, but when it does hit the market, it could revolutionize the way motorcyclists are seen—and heard. Unfortunately, in the wrong hands a device like this could be rather loud and obnoxious. At Russ Brown Motorcycle Attorneys, we love concepts and ideas that revolutionize the motorcycle industry and make the future of motorcycling so interesting. We also understand the dangers that motorcyclists face on America’s roadways and we applaud anyone who seeks to make them safer. If you or someone you love is injured in a motorcycle accident, it is important to have an experience motorcycle accident attorney on your side who understands the complexities that often surround motorcycle accident cases. We understand motorcyclists—because we ARE motorcyclists. Call us today at 1-800-4-BIKERS for a free consultation or to learn more about BAM, our free roadside and legal assistance program. We Ride—We Care—We Win! Russ Brown Motorcycle Attorneys, fighting for injured motorcyclists from California to Pennsylvania, Ohio to Florida, New York to Nevada, Arizona to Colorado, Wisconsin to Michigan, Georgia to Arkansas. Regardless of where your motorcycle accident happened we have an experienced motorcycle lawyer ready to fight for you. Motorcycle accident attorney, biker crash lawyer. Love it – I want one!